About 2500 years ago, in Kaladi Kerala, India, a learned brahmin, by the name of Sivaguru, and his wife, Aryambal, spent their life in pooja and in giving alms to poor and in other good deeds. This childless couple went to Trichur and performed puja for 48 days to Lord Vadakkunathan (Lord Shiva) and prayed for a son. 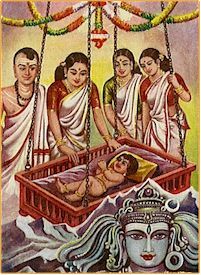 Lord Shiva melted in their devotion and was bornto Aryambal. As the Lord had already promised that he will be born to do good to this world, the child was named Sankara. Sam means prosperity and Karathi means te giver. All the visitors stood in awe at the divinity of the child and said “This is not an ordinary child”. As Shankara grew up, he attraced everybody with his intelligence and kindness. At the age of three, he was given “Aksharabyas”, i.e., the learning of writing and reading. At the age of four, he lost his father. At the age of five, he was initiated in Brahmacharyam i.e., self-imposed celibacy that is generally considered an essential prerequisite for spiritual practice. As per the practice the disciple had to go from house to house and take alms and submit this to his guru (teacher). On a Dwadasi day Sankara happened to go to the house of a very poor lady and asked for the alms. The lady did not have a single grain of rice in her house to give. All she had kept a single berry fruit for herself. She unhesitatingly gave this fruit to Sankara as she could not send him empty handed. Sankara was moved by her selflessness and the poverty of the lady and prayed to Goddess Lakshmi in a beautiful sloka which is called “Kanaka Dhara Stotram”. On completion of this stotram, Goddess Lakshmi appeared in person and showered a rain of golden coins on the poor lady’s house. One day, the rishis came to him and reminded him of his duty to the land in spreading spiritualism. Sankara agreed it was time to become a Sanyasi and go all over the country to kindle religious ferver. One day when Sankara was taking bath, a crocodile caught hold of his leg. Sankara called out to his mother. 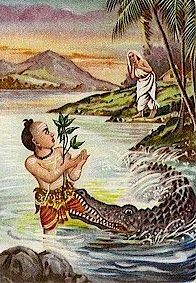 Aryambal came running and to her horror she found her son in the grip of the crocodile and she cried that se did not know how to help her son. Sri Sankara informed his mother that his life was nearing to an end, but if he became a Sanyasi, he could start a new life as a sannyasi. Thus Sri Sankara obtained permission from his mother to become a sannyasi. Sri Sankara went in the search of a Guru to be formally initiated as a Sannyasi. At the banks of the river Narmada, he found the river gushing forth into floods. 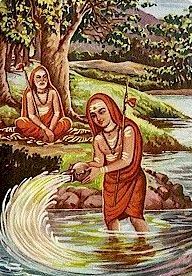 By using his powers, he encapsulated the river in his Kamandal (a vessel sannyasi’s carry) and released it in the banks of the river. Sri Govinda Bagawathpathar, an ascetic who saw this, marvelled at Sri Sankara then took him on as a disciple. Sri Govinda Bagawathpadar taught various vedas to Sri Sankara. He also taught about Advaita, the principle that every one in this world is the manifestation of God and that God and Atman are one and the same. He advises Sri Sankara to go out in the world and spread this truth throughout the country. One of Sri Sankara’s famous poetic composition is “Bhaja Govindam”. Sri Sankara went to Kasi and by that time, he had a lot of disciples. 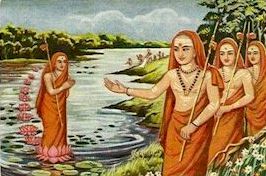 One of disciple Sanandhyaya, was washes the clothes of his Guru and suddenly Sri Sankara called him to the other bank of the river. Sanandhyaya, little realising that he would drown, starts walking into the river. However, the Grace of his Guru resulted in a lotus materialising wherever he was keeping his foot. When asked as to how did he cross the river, he says that when his Guru called, he did not worry about anything. Sri Sankara named him as Padma Pada (lotus feet). His mother, Aryambal was in her deathbed, and as per his promise while taking celibacy that he would be by her side while she breathes her last. He reached Kaladi and paid his last respects. 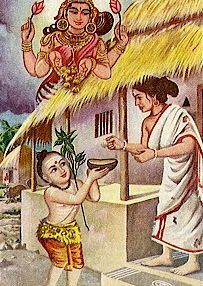 Aryambal was happy that her son had come. Sri Sankara prayed to Lord Narayana who appeared in person and blessed Aryambal. 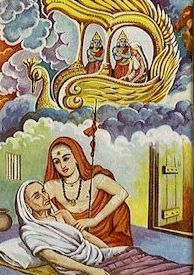 Sri Sankara did the last rites for his mother and put her in the pyre himself and lit it using yog-agni. Sri Sankara completed his travels and went to Badrinath. Lord Vishnu appeared before him and told that image of Badarinaraya in Alaknanda river should be taken out and a temple be built for it. This temple is called Badrinarayan temple and is one of the important religious places for Hindus. 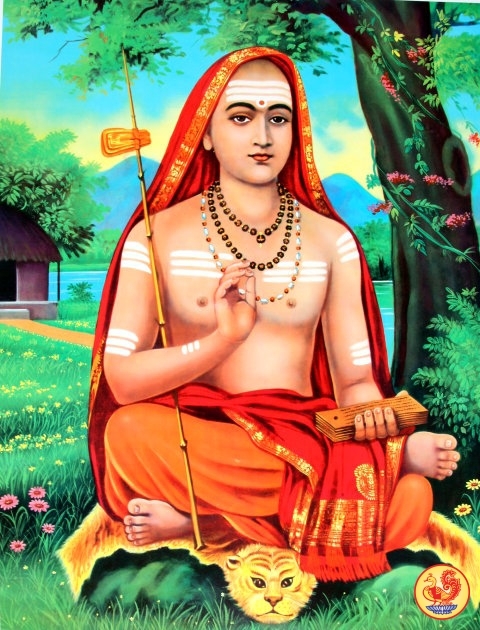 Towards the end of his life, Adi Shankara travelled to the Himalayan area of Kedarnath-Badrinath and attained videha mukti (“freedom from embodiment”) at the age of 32. There is a samadhi mandir dedicated to Adi Shankara behind the Kedarnath temple. This entry was posted in Biosketch, History and tagged Adi Shankara, Adi Shankaracharya, Hindu Dharma, Sanatana Dharma, Vaidika Dharma on May 1, 2015 by arisebharat. It was not 2500 years ago. It was in between 700-800 CE.